Anne Watanabe walking the runway for Peter Som Spring 2007 collection in New York City. Anne is the daughter of Japanese actor, Ken Watanabe who starred in Memoirs of a Geisha, The Last Samurai, Letters from Iwo Jima, and Batman Begins. Credit: Photos from Style.com and Google.com. Han Jin walking the runway for Peter Som Spring 2007 collection in New York City. Han Jin walking the runway for Luca Luca Spring 2007 collection in New York City. Du Juan and Han Jin in 3.1 Philip Lim Fall 2007 collection in New York City. Won, Sung and Philip Huang in 3.1 Philip Lim Fall 2007 collection in New York City. Du Juan in Louis Vuitton Spring 2007 advertising campaign. It appears on the LV website. Credit: Photo captures from www.louisvuitton.com. Ling stars in the 2007 Ford Edge TV commercial entitled, Edge of City. You can watch the ad on YouTube. She is in the first 2 seconds of the ad only. Credit: Video captures from YouTube. Hye Park and Erin Wasson in H&M Spring 2007 advertising campaign. Credit: Photos from H&M website. Hye Park is extremely visible this season. Aside from her appearance in the GAP Spring 2007 ad campagin, she can also be seen in the latest H&M Spring 2007 print ad and webpage. Hye Park is in the GAP Spring 2007 advertising campaign. Credit: Photo from Gap Inc. website and Bellazon.com. Han Jin models Banana Republic's Spring 2007 Collection. Credit: Photo from Gap Inc. website. 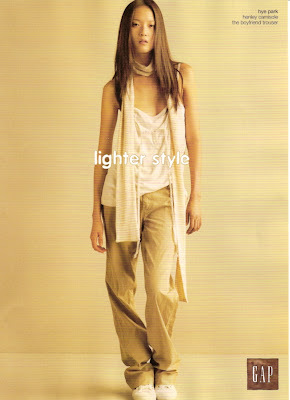 Ai Tominaga is on the latest Banana Republic advertising campaign for Spring 2007. This ad appears on both print and the (cover) webpage of the brand. Credit: Photos from Gap Inc. website. Ujjwala Raut in Revlon LookBook Spring 2007 webpage. You can see the photos at Revlon.com. Credit: Photos from Revlon's website.